In addition, about 30,000 baits will be dropped by aircraft on Wolfe Island, the Thousand Islands Bridge (Ivy Lea), and near Cornwall in late-August. These areas are being targeted because of the presence of rabid raccoons in New York near the Ontario border. The flavoured baits immunize most skunks, foxes, and raccoons that eat them. 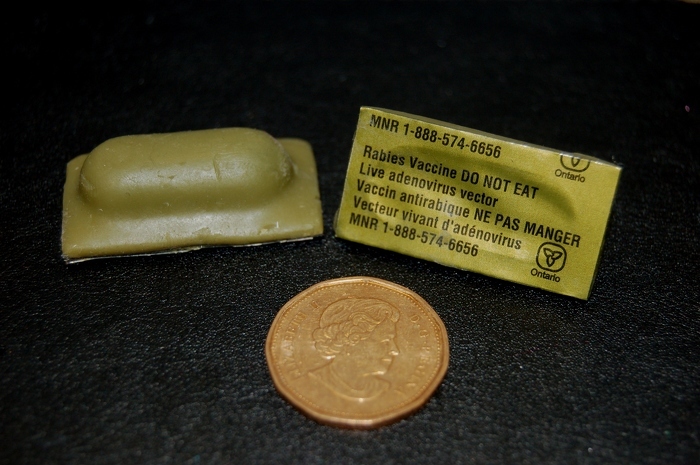 Baits are small and khaki green, with a toll-free rabies information line number stamped on them. If you see baits, please do not disturb them. Ontario's bait drop program is one of the most successful rabies control programs in North America. The Ministry of Natural Resources and Forestry is responsible for wildlife rabies research and management programs in Ontario. This includes distribution of vaccine baits. Exposure to a bait is not harmful to people or pets. However, if a person or a pet comes in contact with the vaccine in the bait, contacting a doctor or veterinarian as a precaution is recommended. Protect your family and pets from rabies. The public should not trap, transport or feed wildlife. This document was published on August 04, 2016 and is provided for archival and research purposes. Rabies vaccine baits immunize most skunks, foxes and raccoons that eat them.